You might want to make this dedicated crosscut sled if you cut a lot of stock at 90 degrees to the blade. It's far more accurate than using a miter gauge, especially when cutting panels and longer boards. It's also easy to build. And you can add a few conveniences like an adjustable stop block for shorter pieces or toggle clamps for holding your workpiece to the sled. And when you're finished using it, simply take it off the saw and hang it on the wall, out of the way. This simple crosscut sled makes easy work of repetitive cuts with the addition of an adjustable stop block that slides in the fence mounted t-track. 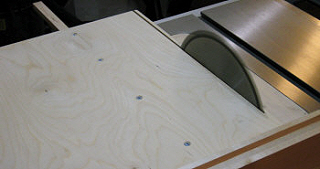 I use this type of table saw sled for practically all my cross-cutting operations. Compared to many table saw sleds, this one's a light-weight and quite easy to maneuver on and off the table. And with one runner in the miter slot and one sliding against the left edge of the saw, this crosscut sled stays square to the blade. 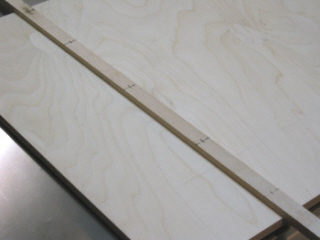 A piece of baltic birch plywood is used for the sled body and birch lumber for the runners and fence. I sized a piece of 1/2" thick baltic birch plywood to 21" deep by 24 1/2"" wide. 1/2" will be trimmed off the width after the runners and fence are attached. This strip was then ripped into two runners. I cut one at 3/4" and tried it in the miter slot. The fit was a little sloppy, so I tapped the fence over ever so slightly to cut the second one a few thousands wider. The second one was a tighter fit and only needed a bit of hand sanding to get it to slide smoothly with very little play. The runners were then cut to 30" in length. There's some talk on the internet advising against the use of hardwood for runners, mostly because changes in humidity will affect the fit of the runner in the miter slot. This hasn't been an issue for me as my basement shop stays dry and pretty much the same temperature all the time. If you experience humidity problems, you might want to use a steel runner using cold rolled... or better yet, oil hardening ground flat stock. Other excellent alternatives are UHMW Strip 3/4" X 3/8" X 48" By Peachtree Woodworking and this Kreg 30-Inch Jig and Fixture Bar. The runner that slides in the miter slot was recessed 1/8" into the plywood with a 3/4" wide dado. Without the dado, there's a good chance the runner could work itself loose over time under heavy loads and repeated use. A snug fit here is preferable. 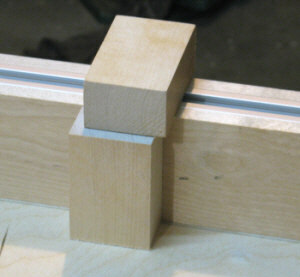 Also, by recessing the runner in the dado, the runner will stay straight for consistantly square crosscuts. To find the location of the miter slot runner on the plywood, I measured over 24" from the left edge of the plywood and left a mark with a pencil. This 24" measurement will be the finished width of the sled after the right edge is trimmed off later. A few taps with a rubber mallet were needed to seat the runner in the dado. The runner overhangs the plywood 3" at the front and 6" at the rear. I then measured over 5" to the left of that pencil mark and made another mark. This is the distance from the right side of the miter slot to the left outer tooth edge of my crosscutting saw blade. Now it was just a matter of setting up my dado blade stack to 3/4" and setting the rip fence so that the second mark I made was lined up with the right side of the dado blade. 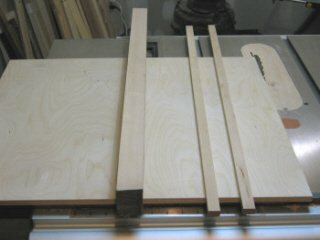 I cut the dado 1/8" deep and then flipped the plywood over and tapped the miter runner into the dado slot with 3" of runner extending from the front and 6" at the rear end of the plywood. This extra runner length gives the crosscut sled stability when at it's extremes of travel. 7/64" holes are drilled through the runner and plywood after I marked the screw locations. I marked off five evenly spaced lines on the bottom of the runner. A line was drawn 1" from each edge of the plywood, one in the middle of those lines and then one between the middle and outside line on each end. I then drilled a 7/64" hole at the center of each line using the drill press. Since the runner was such a snug fit in the dado, I could drill through both pieces without having to clamp the runner to the plywood. After the holes are drilled, the sled is flipped over and the top of the holes are countersunk for the #10 - 3/4" wood screws, and then the screws were driven in. The runner that rides against the left side of the saw table is clamped to the plywood. 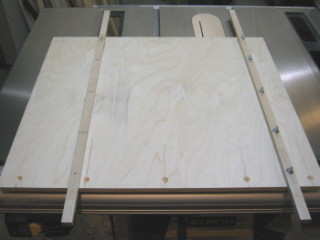 With the miter slot runner attached and the crosscut sled in place, the side runner is clamped to the plywood with the runner tight against the side extension wing of the table saw. The side runner should overhang the plywood the same amount as the miter runner. The side runner is then marked and drilled the same as the miter runner, except the holes are 3/16" instead of 7/64". After the holes are drilled, the runner is unclamped and the runner holes are enlarged to 1/4". The 3/16" holes in the plywood are countersunk from the top. 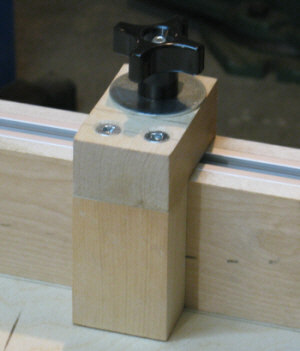 Using 1 1/2" long 3/16" taper head machine screws, flat washers and nuts, the runner is attached to the plywood. The larger holes in the runner will allow a bit of adjustment to remove any play and adjust for wear. The side runner should be adjusted so the sled will move freely yet have no or minimal side play. The fence will make or break the accuracy of any cross cut sled. It needs to be dead flat on the work side and an accurate 90 degrees to the plywood as well as the blade. Holes are drilled and countersunk from the bottom to attach the fence to the cross cut sled. I used a piece of rough sawn birch that I had jointed flat and square on the two sides that count -- the work face and the bottom. The other two sides were ripped to size with the table saw. The fence measures 2 1/2" in height by 1 1/2" in width and is 36" long, although I'll lose 1/2" in length when the crosscut sled is trimmed with the saw blade. A 3/4" x 3/8" dado was cut in the top to attach t-track, which will be used for an adjustable stop block and other sled accessories. Five holes were drilled in the plywood 3/4" from the front edge to attach the fence. These were then countersunk for 2" long #12 wood screws. Make sure the right side hole is in far enough to clear the blade when it's time to trim the crosscut sled to it's final width. The fence is clamped flush to the front and right side edges of the plywood with c clamps. After lowering the blade below the table and with the crosscut sled mounted on the saw, the fence was clamped even with the front and right side edges of the plywood. I drilled a pilot hole in the first hole on the right hand side (blade side) and drove in a screw to secure that end. The clamps were removed and the fence was squared to the right hand side miter slot using a framing square. Once square, I reclamped the fence on the left hand side where the sled overhangs the saw's table. A framing square is used to get the fence close. This will get us pretty close to square, but the proof is in the pudding as they say, and a few test cuts will be made to make sure we're square before the other screws are driven home. With the sled pulled back and the blade raised high enough to clear the fence, the crosscut sled is trimmed to it's final width. Use your crosscut blade to make this cut. It's a good idea to clamp a backer board against the back side of the fence to prevent tearout and splintering as the blade exits the cut. Trimming the excess material off the crosscut sled after the fence is squared. After a few adjustments and test cuts, I finally got the fence dialed in to cut consistently square. I used an 8" machinist's square to check the accuracy of the cuts. With the left side still clamped, I pulled the crosscut sled back and drove in the rest of the screws to secure the fence to the plywood. It's always a good idea to drill pilot holes to prevent splitting the fence. A little sandpapering along the bottom edges of the plywood to round over the edges and a couple of coats of paste wax on the bottom will help keep the sled sliding smoothly. A 3/16" rabbet at the bottom of the fence gives the sawdust a place to accumulate between cuts. Fence improvement  After using this sled for awhile, I found I was forever cleaning sawdust away from the fence in order to make another cut. It got a little bothersome to say the least. So when I made this dado jig attachment later on, I took the time to remove the fence and cut a 3/16" rabbet in the bottom edge. Now the sawdust has some place to go and I don't have to worry so much about cleaning it out after every cut. As an added bonus, if the workpiece's bottom edge isn't quite perfect, it will still lay flat against the fence. For the little bit of time it took to cut the rabbet and resquare the fence, it was well worth the effort. To make your crosscut sled even more efficient, consider adding a length of t-track to the top of the fence. It's useful for accessories like a stop block or toggle clamps for those hard-to-hold short workpieces. Countersunk screws hold the t-track securely in the dado cut in the top of the fence. Since I had already cut the dado in which the t-track will sit, all I had to do was cut the t-track to length, then drill and countersink the mounting holes. Cutting the aluminum t-track is easily accomplished with a miter saw equipped with a carbide tooth blade. I use an old 40 tooth blade for this purpose and save my good blade for wood. The screws should be spaced every three to four inches. 3/4" or 1" long screws are more than adequate. Nothing is more frustrating than trying to cut several pieces of stock exactly the same length by cutting to a mark made with a tape measure and pencil. Good luck with that! 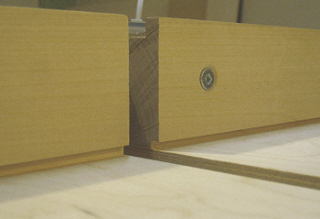 The adjustable stop block is made from two pieces of 1" x 2" birch. A simple stop block is all that's needed to end that nightmare and let you cut as many pieces the same length as you would like. Keeping with the birch theme, I found a length of 1" x 2" birch that would be perfect for a stop block. After squaring one end, I laid that end down on the plywood with the stock against the fence and drew a line across it using the top of the fence as a guide. This was then cut to length using the crosscut sled. The cut piece was then set against the fence and the leftover stock was positioned squarely on top of it and then marked using the back of the fence as a guide. This was also cut to length. The two pieces are glued and then screwed together using countersunk screws. The two blocks were clamped together in a vice, then drilled and countersunk for 2 1/2" long # 12 wood screws. Before assembling, I squeezed some yellow wood glue on both mating surfaces and wiped off the excess glue after the screws were tightened. To find the position of the hole for the t-bolt, lay the stop block flat against the fence and eyeball the center of the t-slot and mark it on the side of the block. Using a square, scribe a line from that mark up the side and over the top of the stop block. Now measure halfway side to side across the top (1") and mark it for drilling. Since I'm using a 1/4" t-bolt, I'll drill the hole to 1/4". The finished stop block is tightened using a t-bolt, fender washer and knob. To assemble the stop block on the crosscut sled fence, I use a 3" long 1/4" x 20 t-bolt, a large fender washer and a 2" plastic knob with integral steel threaded insert. These parts can be purchased seperately or in a convenient jig hardware kit . You'll never regret taking the extra time to build this stop block. It's easy to set up, lets you make very accurate repeat cuts and when you don't need it -- just loosen the knob and slide it off in seconds. Making this crosscut saw is an easy project that doesn't take very long to build, but will save you many grey hairs from trying to get square cuts with your miter gauge. 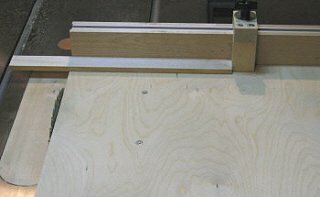 I've seen many table saw cutoff sled plans on the internet for sale, but you don't really need a plan to build something as basic as this. Besides, those plans are mostly general in nature anyway, and are not for any specific table saw. 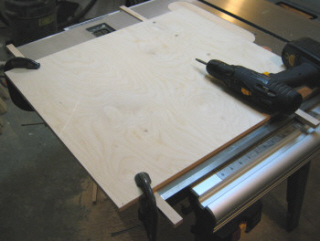 So look over this article, adapt the information to the measurements of your table saw and start building your own crosscut sled. 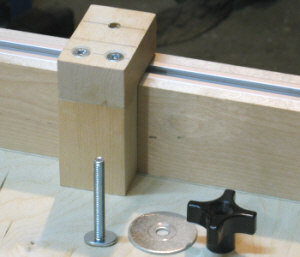 Build a dado jig attachment for the crosscut sled. 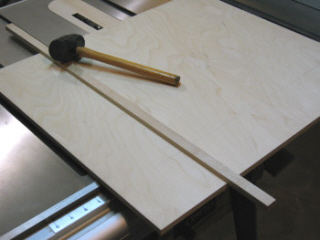 You can use this style of crosscut sled to quickly cut rabbets and tenons on the ends of long workpieces. 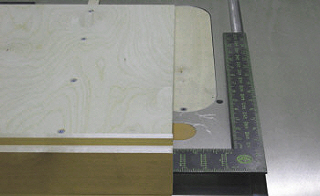 To prevent blowout and splintering on the back edge, place a square, straight board between the fence and workpiece. The edge of the board should be even with the end of the rabbet or tenon.